Montana’s four distinct seasons offer weather that could—maybe—be referred to as a bit dramatic. In the best way possible, of course. 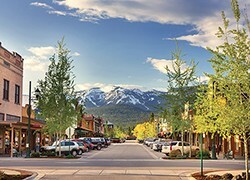 Montana's Glacier Country, and our regional community anchors of Kalispell, Missoula and Whitefish, experiences diverse weather conditions ranging from winter snowfalls of 300+ inches (in the mountains) to long summer days, often followed by beautiful and mild autumns, complete with vibrant hues of yellow and gold. WINTER: Our winters drop plenty of snow. If you're planning on spending time outdoors, be sure to dress warmly and layer clothing. Always travel with snow boots, a hat and scarf, gloves and a warm winter coat. SUMMER: Summer in Montana is heavenly, with long sunny days. Our warm afternoons turn into cool summer evenings, so keep a lightweight sweatshirt or jacket on hand. Always be sure to carry proper bug repellant, sunscreen and water to help stay comfortable while exploring. SPRING AND FALL: Our shoulder seasons are unpredictable. Be prepared for early spring and late fall to feel a bit wintry one day and not the next. The key? Layers. Visibility: see and be seen. Be sure to keep your headlights and taillights clean. Keep windows clean and clear snow off your vehicle before traveling. Leave plenty of room between your vehicle and those around you. Drive defensively and test your vehicle's traction on the road. Give yourself extra travel time during winter. Be sure to drive at appropriate speeds for current road conditions and always pass with care. Leave the cruise control off for winter driving. It can accelerate your vehicle when you hit a patch of ice or slippery bridge deck.